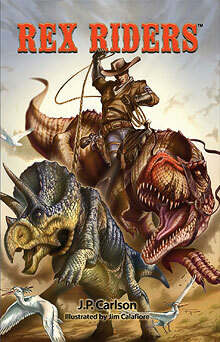 The “Weird West” is a term used to describe the mixing of Wild West lore with other more fantastical genres of fiction. It was perhaps made famous initially by DC’s (Detective Comics) 1970’s title Weird Western Tales, which combined cowboys with elements of horror, but the ideas pre-date that. The special effects guru Willis O’Brien (of King Kong fame) might well be considered the godfather of this fusion, with a script melding cowboys with dinosaurs that not only gave rise to 1956’s The Beast of Hollow Mountain, but also the 1969 film Valley of Gwangi. In both films, a carnivorous dinosaur rampages through turn-of-the-century Mexico, combining the stock adventure favourite of cowboys with dinosaurs. In that tradition, 2000A.D.’s cowboys rounding up the Late Cretaceous herbivores as livestock for the meat-less 23rd Century in Flesh, was extremely popular when it first appeared in the comic in 1977 – and, indeed, the original writer Pat Mills successfully returned to that world in March of this year (2011) with the latest instalment, Flesh: Texas. Where the West is concerned….Weird Works. The pretext for the presence of the dinosaurs – that of conservation by an extraterrestrial race – is familiar, used by Anne McCaffrey in her 1978 “Dinosaur Planet” – but after that, everything about the story is startlingly original. The characters have an authenticity and depth that makes them believable, and are far from stereotypical: Carlson has skilfully presented the mythos of Old West values and honour through a 21st century lens, so that age, gender, ethnic or racial group does not constrain any character. Maria del Fuego, a 14 year old Hispanic girl is as much of a hero as Zeke, the book’s central character, from whom we experience most of the narrative. And the story that those characters travel through just keeps growing and growing – the extraterrestrial environment is seamlessly linked to the Old West as though perfectly natural, and more of a “jungle adventure” than anything outlandish. As much a tale of cowboy adventure and exciting dinosaur encounters, the canvas of the narrative is huge – in one scene, the two central protagonists discuss the future of the Old West, and D’Alessandro’s speech about the changing world is reminiscent of Tolkien writing about the inevitable onslaught of the future on an idyllic rural way of living in Lord of the Rings. Perhaps as a nod to the heritage of this fusion genre, the book has the occasional services of penciller/inker Jim Calafiore, known for his work on Marvel Comics Exiles and DC’s Aquaman. However, it should be noted that, though elegant, they are few in number: the illustrations do not tell the story as a comic would, these twenty or so illustrations are chapter headers, scattered throughout over 400 pages of text. This is very far from a comic. It is extremely hard to find any flaws with the book – for the most part, Carlson skilfully avoids dealing with the animals as dinosaurs at all: to the characters, they are just animals from another “country”, that present threats or opportunities, depending on whether they are rampaging, or a potential agricultural commodity – and one feels that this is exactly how the inhabitants of Dos Locos would react to such an incursion, in that time. If I had – purely as a palaeontologist! – to find a flaw, it would be the knowledge of the palaeontologist Professor Kornbluth: in 1881, I doubt that he would be able to identify an animal as a Baryonyx, over 100 years before Bill Walker found that first claw in a Surrey clay pit. But these are merely pedantic points – generally the characters have exactly the right quantity of ignorance of dinosaurs for average US citizens at that time – which is virtually total. The ending of the book does leave one with the sense that it might not be the last time that we can venture into this “Weird West” version of Texas – and I for one would be happy to do so.